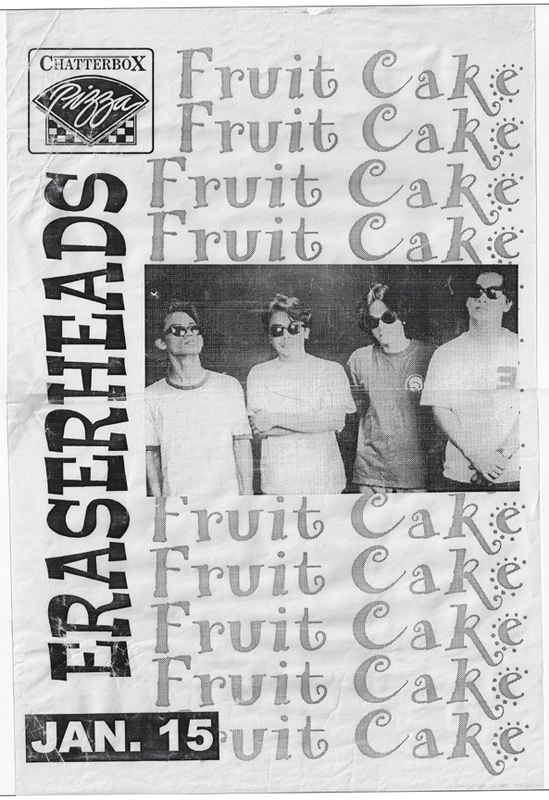 - At the 3rd Katha Music Awards, they won "Best Rock Vocal Performance" (Fruitcake) & "Best Album Packaging" (Fruitcake). 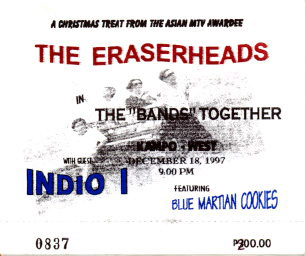 - At the 10th Awit Awards, they won "Best Alternative Recording" (Fruitcake). 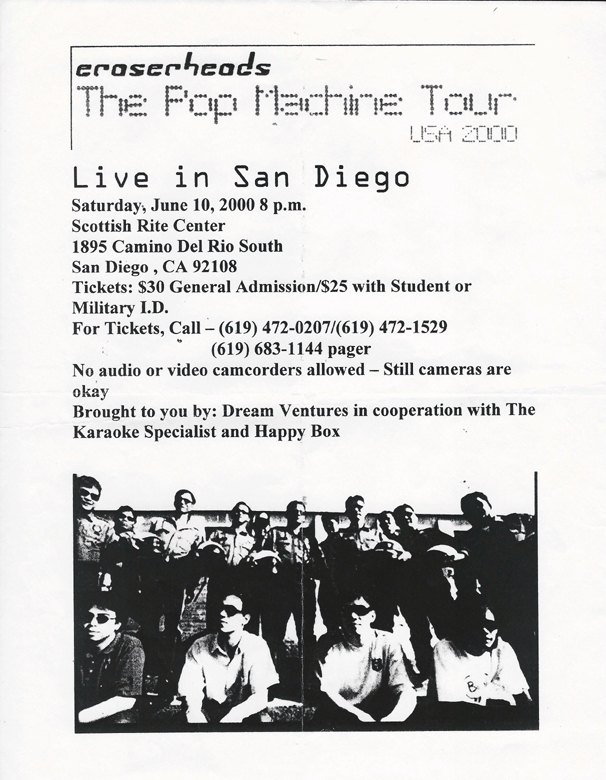 - They won the 1997 Guillermo Memorial Award for "Most Popular Group/Singer/Entertainer". 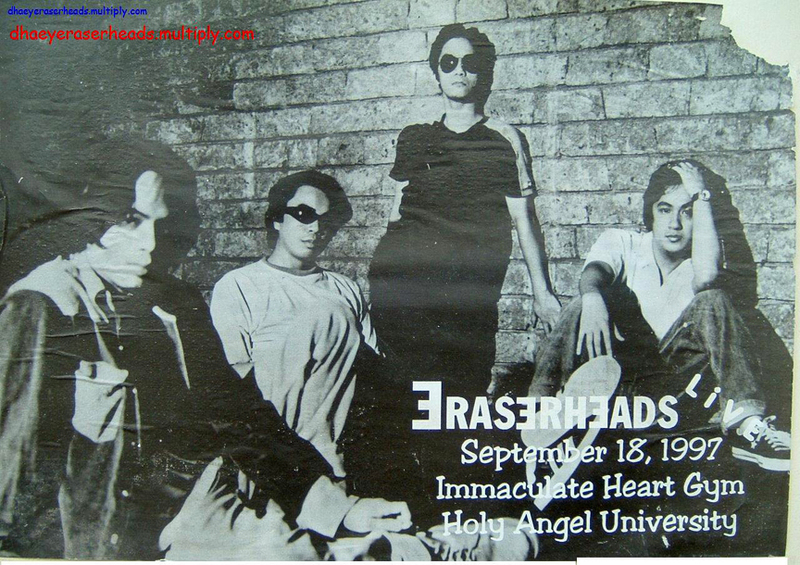 - They won the 1997 Parangal Ng Bayan Award for "Best Group Performer Award". 23 Thur - gig at Kampo, West Ave., Q.C. 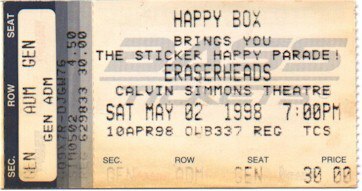 27 Sun - Philippine Airlines flight #PR 102 (Manila - Los Angeles) arrived at Los Angeles International Airport (LAX), 7:11 PM; got out of immigration at around 8:30 PM...the band stayed in a house in Encino, CA...Raimund-Buddy & Ely-Marcus on two separate late-night tours of Hollywood. 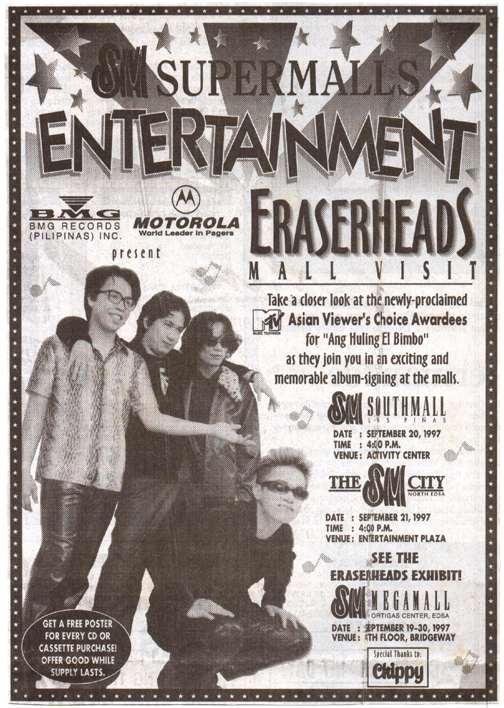 3 Sat - a Raimund-less Eheads took a 3-1/2-hr road trip to Las Vegas, NV...the band stayed at Imperial Palace along Las Vegas Strip. 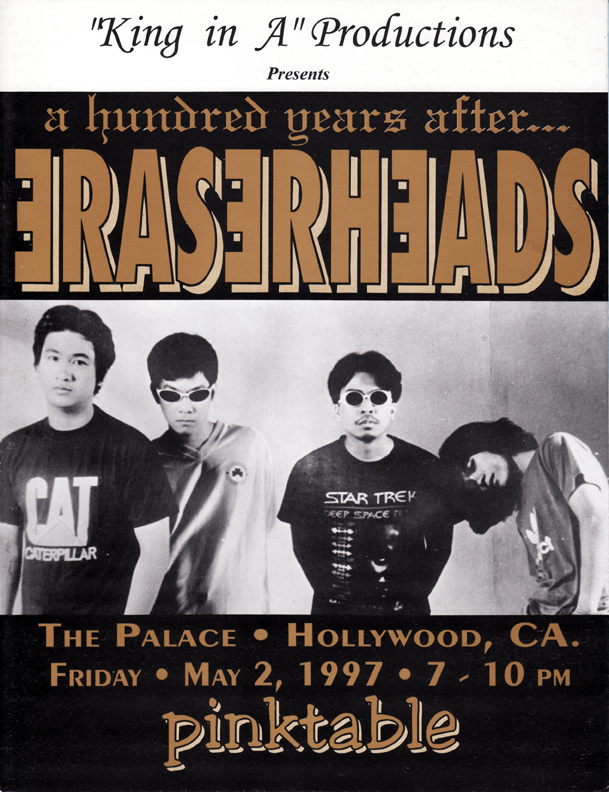 6 Tue - Eraserheads & crew left L.A. for San Francisco; took a 6-hr road trip. 9 Fri - sightseeing & shopping around San Francisco's Haight & Ashbury district & Golden Gate Park; aka "The Ride". 11 Sun - Departure fom San Francisco International Airport to Manila, Philippines. 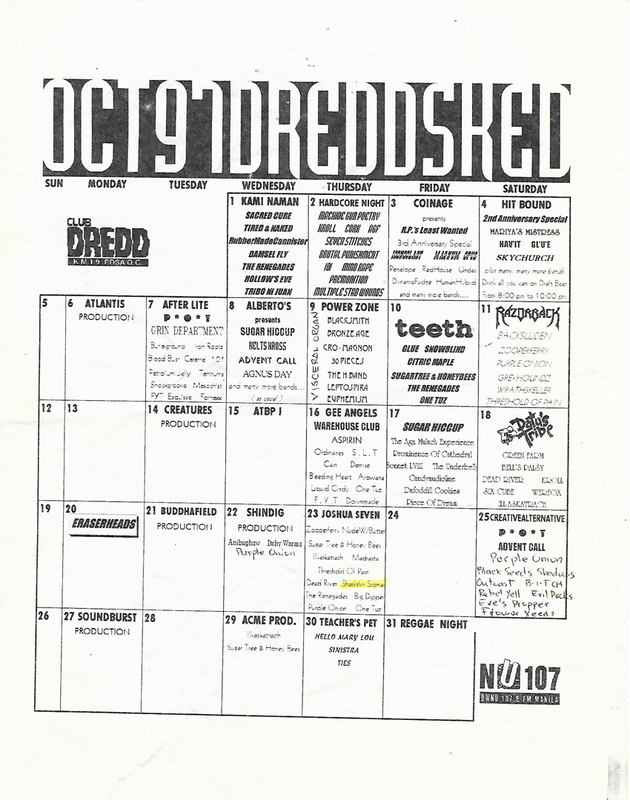 25 Wed - gig at Club Dredd, KM 19 EDSA, Q.C. 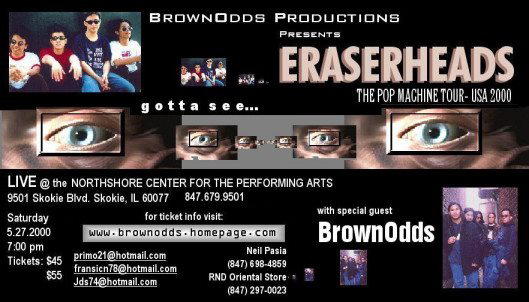 27 Fri - performed at the "U.P. 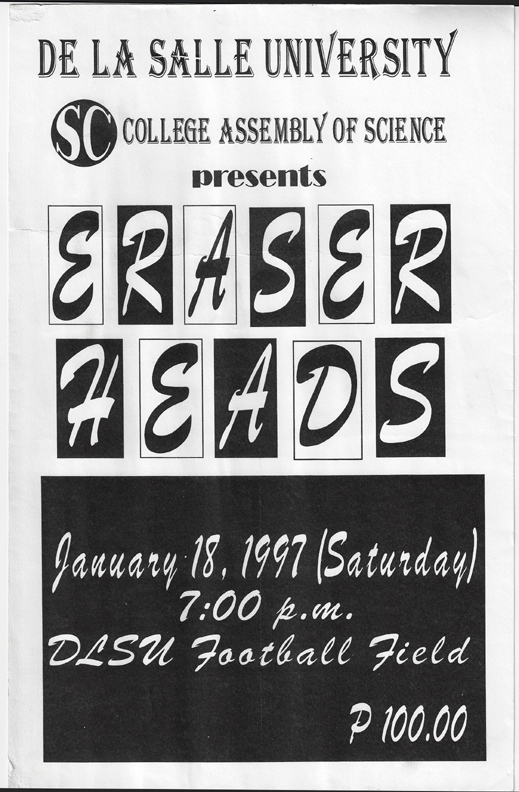 Freshman Orientation", U.P. Diliman, Q.C. 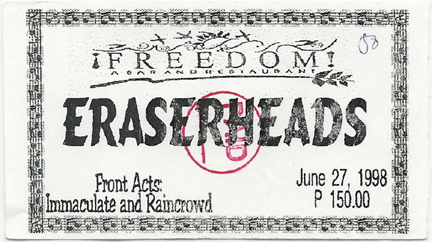 16 Wed - gig at Freedom Bar, Anonas Ave., Q.C. 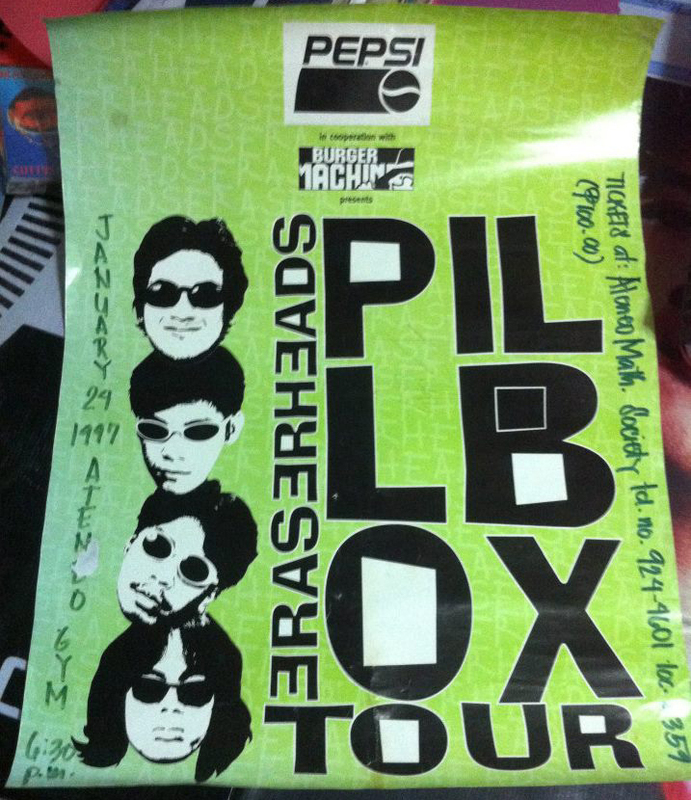 22 Tue - The Eraserheads at the "Adopt-A-Reef" launch of PhilReefs. They have adopted "Acha Reef", one of the poorest in the Philippines, hoping to spread awareness concerning the environmental state of the country. 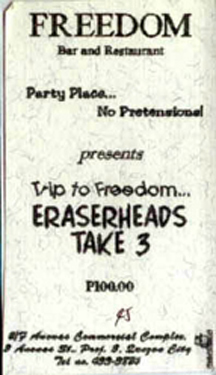 14 Thur - gig at Freedom Bar, Anonas Ave., Q.C. 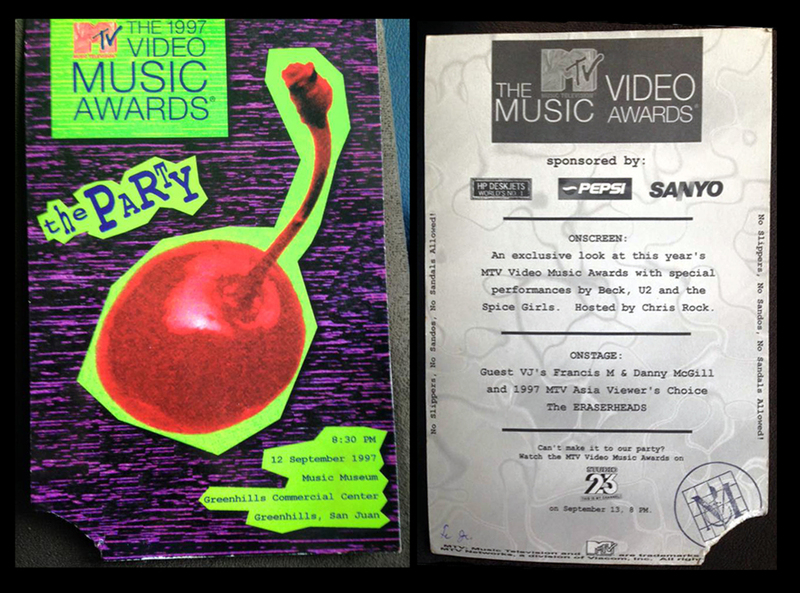 - Delayed broadcast of the "1997 MTV Video Music Awards" on MTV Asia & Studio 23 in the Philippines. 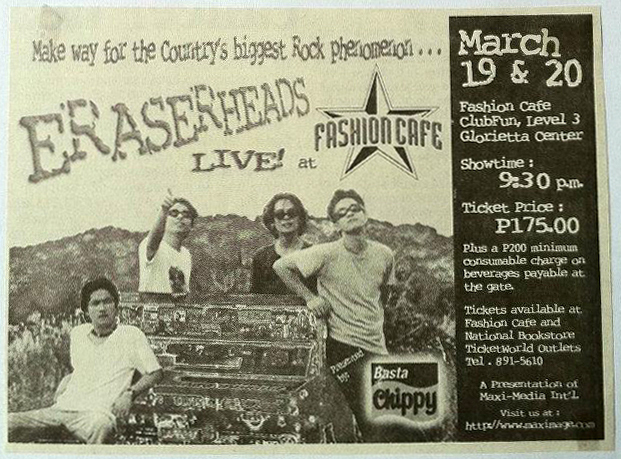 17 Wed - gig at Freedom Cafe, Anonas Ave., Q.C. 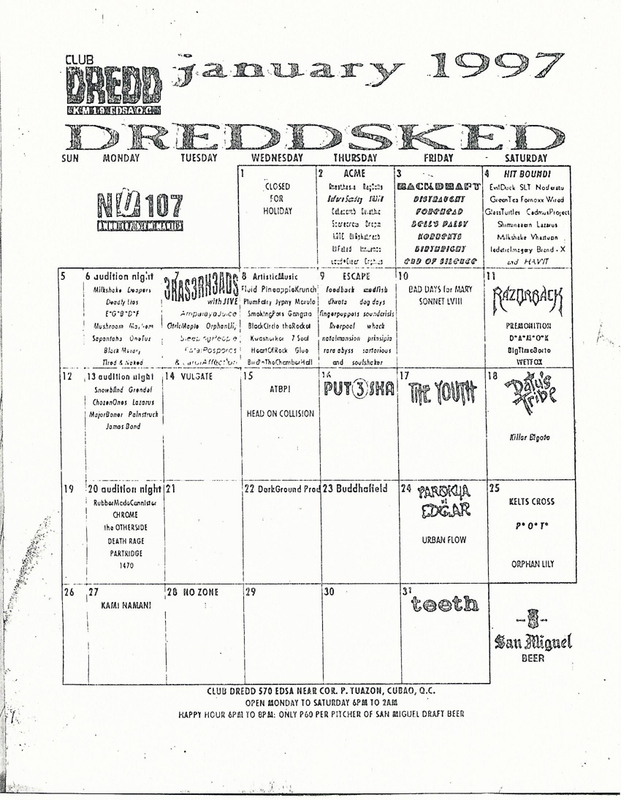 23 Tue - gig at Club Dredd, KM 19 EDSA, Q.C. 29 Mon - gig at 70's Bistro, Proj. 2, Q.C. 30 Tue - gig at Kampo, West Ave., Q.C. 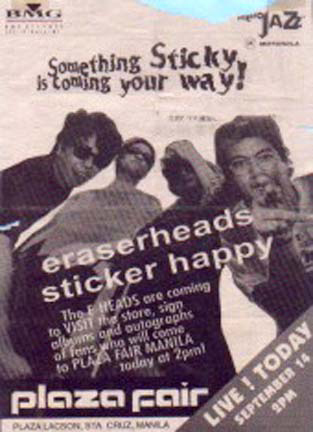 4 Sat - TV guesting on "Eat Bulaga!" 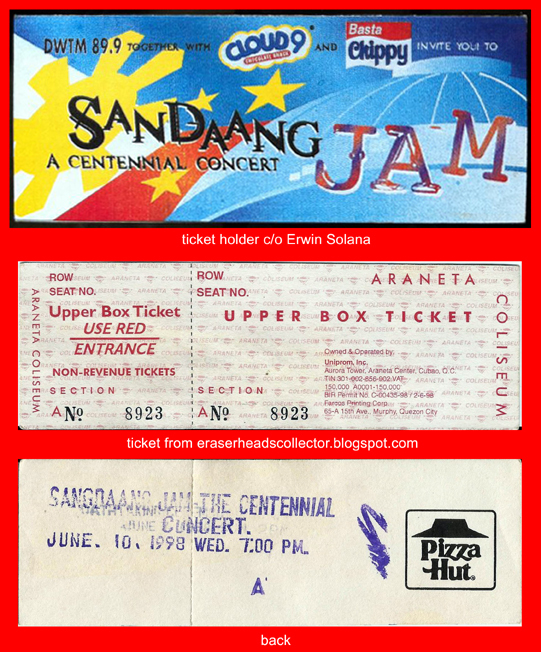 9 Thur - Ely Buendia performed at "Beatles Night" at 70's Bistro, Proj. 2, Q.C. 21 Tue - gig at 70's Bistro, Proj. 2, Q.C. 24 Fri - gig at Kampo, West Ave., Q.C. 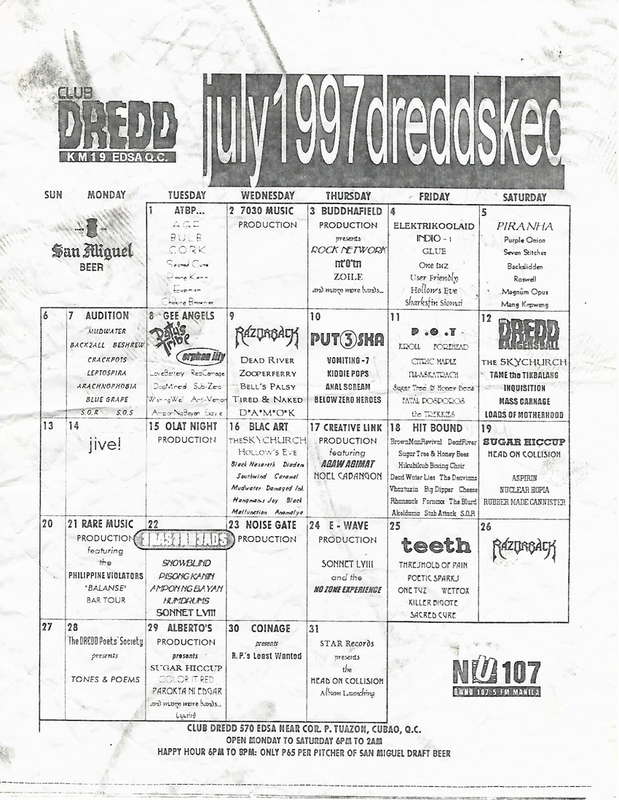 28 Tue - gig at Club Dredd, KM 19 EDSA, Cubao, Q.C. 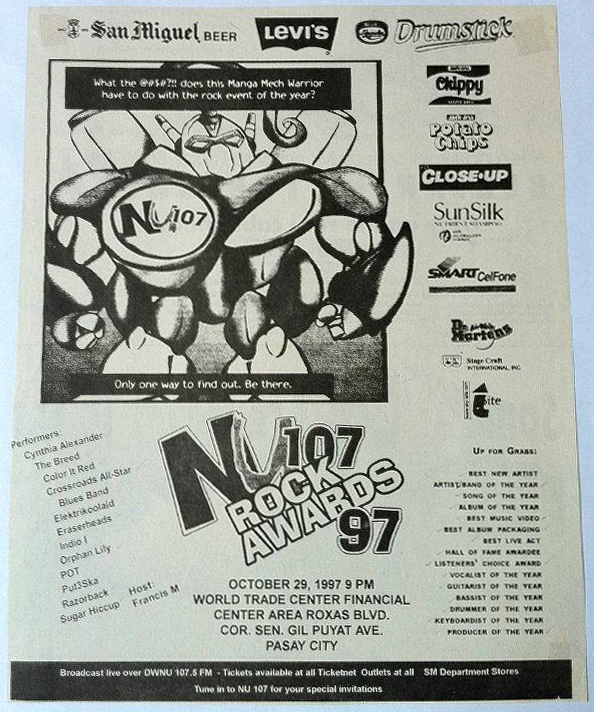 29 Wed - performed "Everything They Say" at the "NU 107 Rock Awards 97", World Trade Center Financial Center Area, Pasay City. 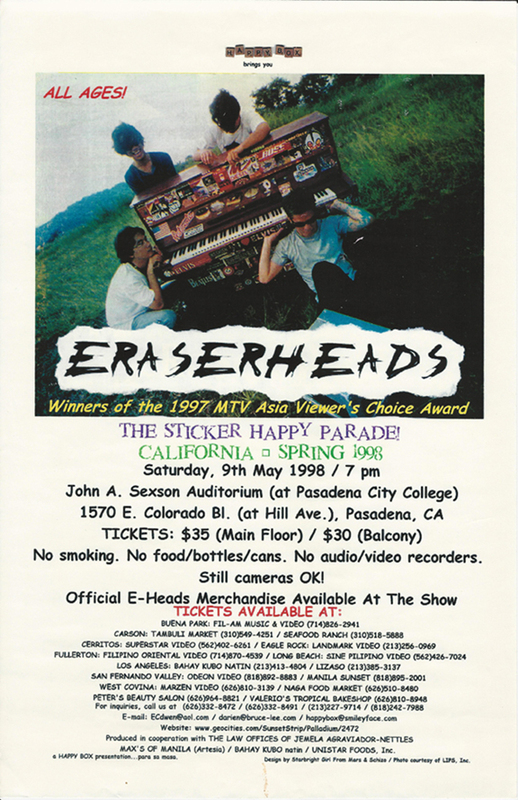 They won "Artist of the Year", "Listener's Choice Award", "Producer of the Year" (Robin Rivera for "Fruitcake"), "Best Album Packaging" (Fruitcake) & "Best Video" (Fruitcake). 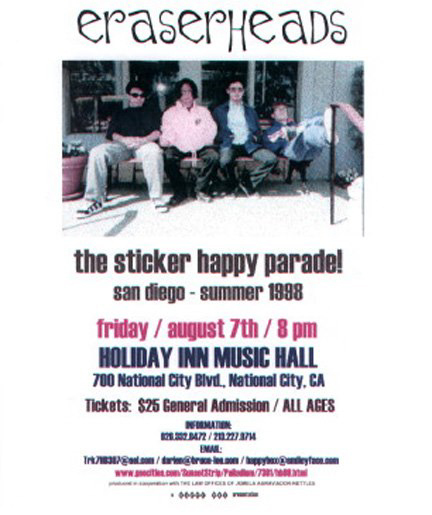 15 Thur - gig at Chatterbox, Q.C...first gig that regularly featured session keyboardist, Noel Garcia. 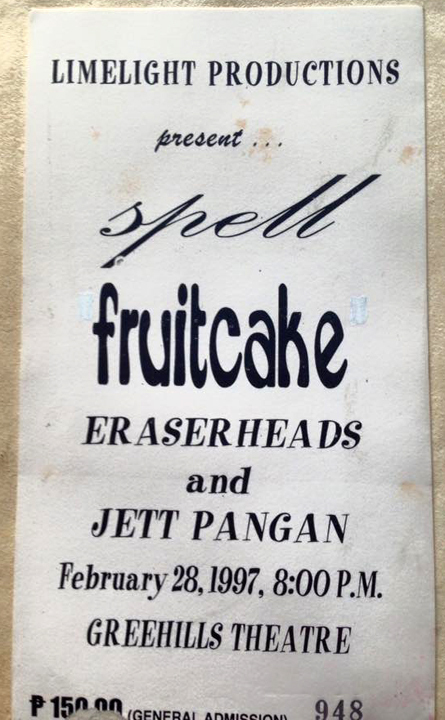 21 Wed - gig at Freedom Cafe, Anonas Ave., Q.C. 22 Thur - gig at Oracafe, Kamias, Q.C. 26 Mon - gig at 70's Bistro, Q.C. 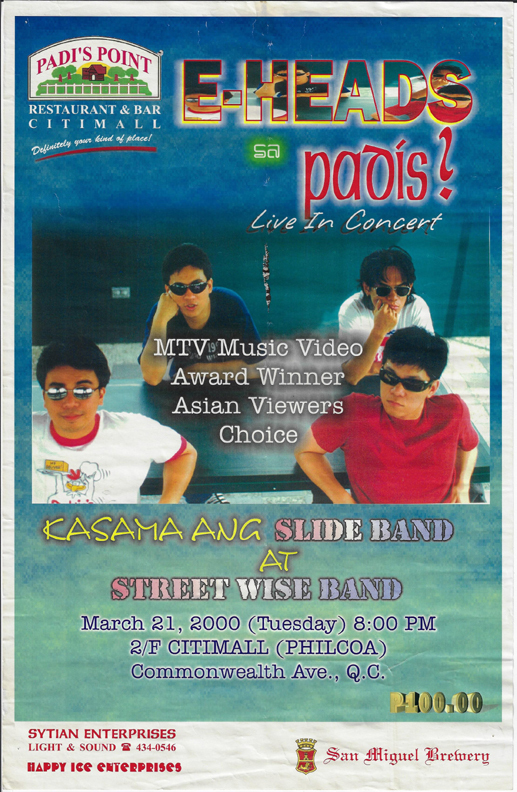 28 Wed - gig at Kampo, West Ave., Q.C. 6 Fri - gig at "U.P. 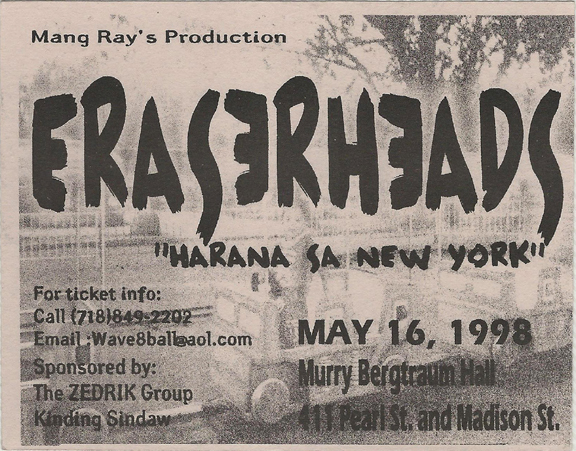 Fair," Sunken Garden, U.P. Diliman, Q.C. 12 Thur - gig at Freedom Bar, Anonas Ave., Q.C. 19 Thur - departure from Manila to Tokyo, Japan...Arrived at Narita International Airport at around 8:45pm. 20 Fri - the usual sightseeing & shopping around Tokyo in the day...visited the offices of BMG Japan & did a radio interview in the afternoon...went to the "Welcome Party" in the evening. 22 Sun - dress rehearsal & interviews...showtime! 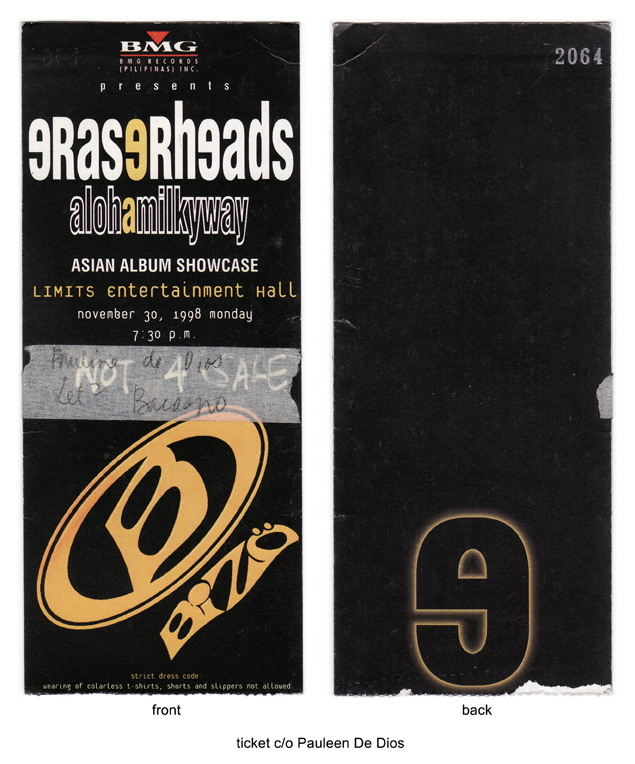 performed "Kaliwete" & "Tamagotchi Baby" (aka "TamaSUSHI Baby") at "Asia Live Dream '98", NHK Hall, Tokyo, Japan (the show was later broadcast on March 5th & 6th by NHK Broadcasting; also on BS-2 cable channel in the Philippines). 23 Mon - Departure from Tokyo to Manila...arrived at NAIA at around 2pm. 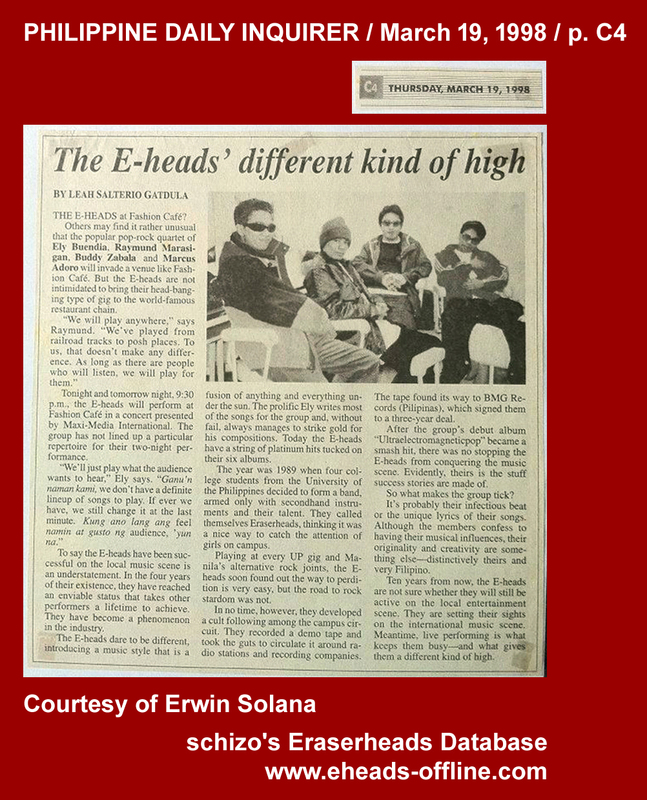 29 Wed - the Eraserheads arrived at the San Francisco International Airport (SFO) from Manila...the band stayed at the Residence Inn Suites, San Mateo, CA. 3 Sun - sightseeing at Fisherman's Wharf with the Happy Box crew...they drove to L.A. later that night. 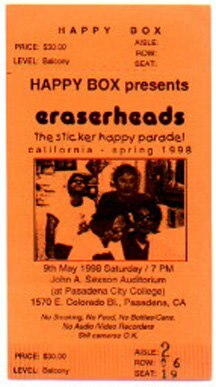 18 Mon - 7 AM, left New York back to Los Angeles, CA....quickie last-minute shopping in L.A...farewell party at Rowland Heights, CA...at midnight, left LA back to Manila, Philippines. 15 Mon - gig at Chatterbox, Q.C. 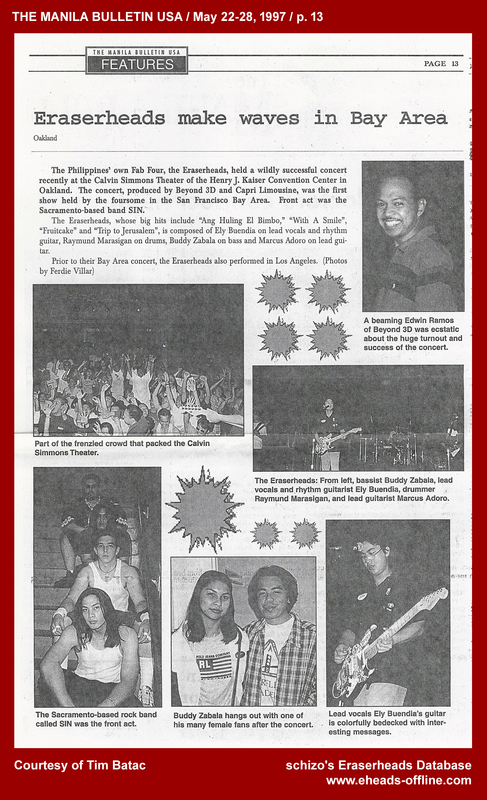 3 Fri - performed at the "Campus Radio 97.1 LS-FM Anniversary", Kampo, West Ave., Q.C. 16 Thu - gig at Chatterbox, Q.C. 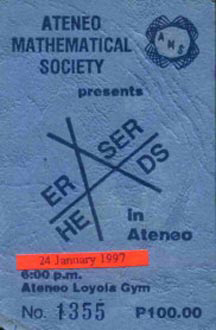 28 Tue - the Eheads left Manila for Chicago, Illinois, U.S.A.
15 Sat - gig at Miriam College, Katipunan, Q.C. 19 Wed - gig at Southern Bulls Concert Bar, Timog Ave., Q.C. 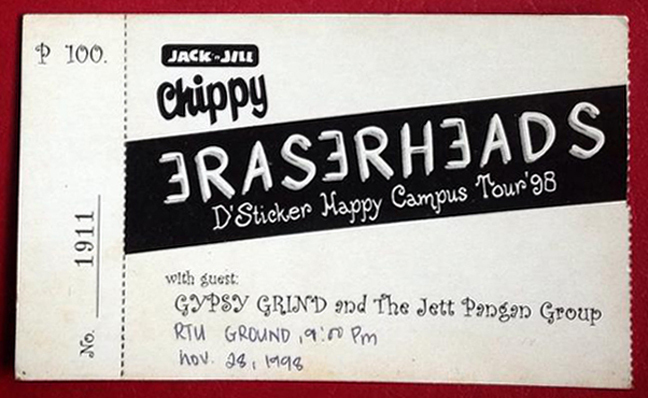 20 Thur - gig at Adamson University, Taft, Manila...gig at Kampo, West Ave., Q.C. 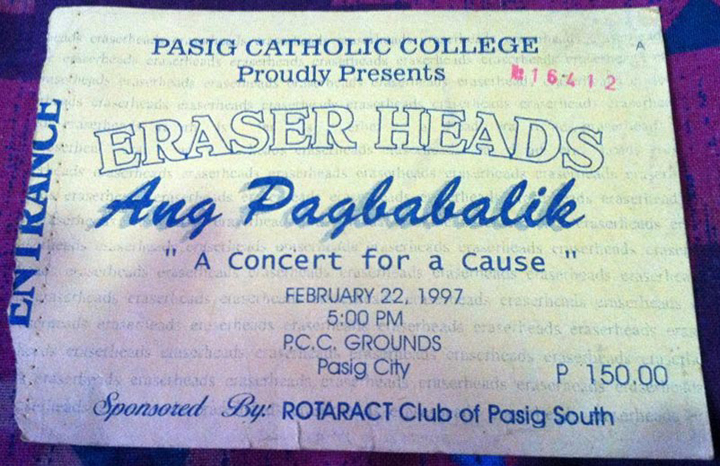 25 Tue - The Eraserheads Mailing List is created on Egroups.com by Jim Ayson of PhilMusic.Com. 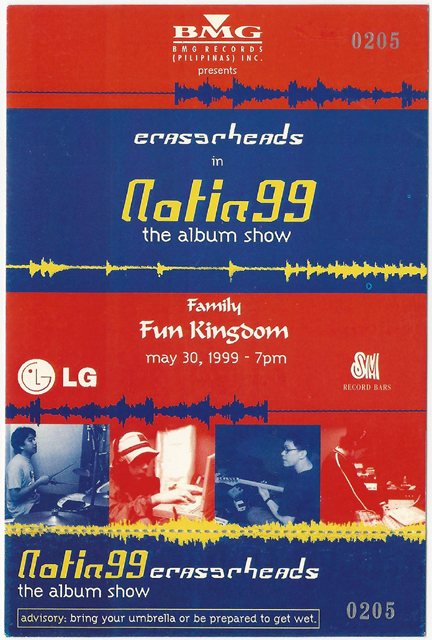 After a poll among its active members, it was finally given a proper group name: Circus, referring to the band's second album. 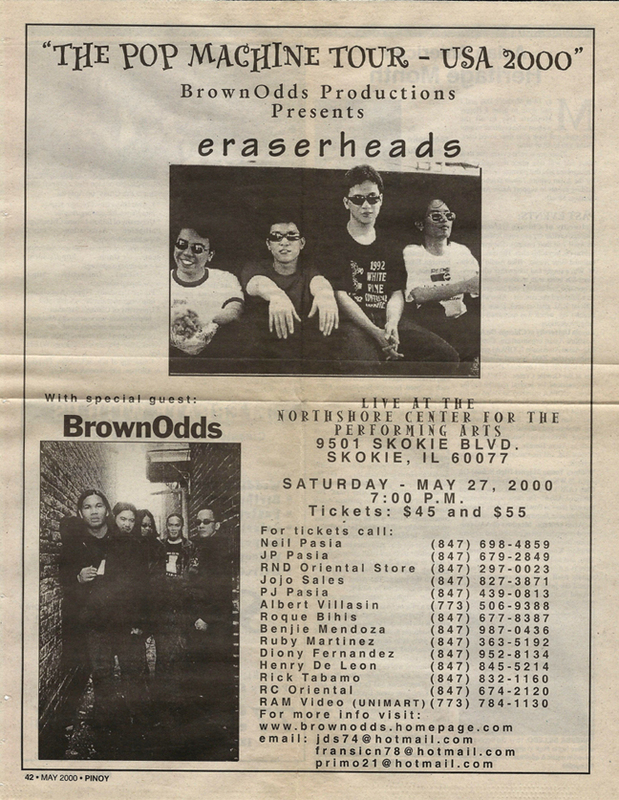 The active members are called "circusfreaks" or "circuseros" (as preferred by the "2008 reunion-era" members). The list is currently hosted by YahooGroups.Com. - They were featured on MTV Asia's "Hot Seat"; appearances on "MTV Land", "Most Wanted", "Videography" & "In Control" were broadcast. 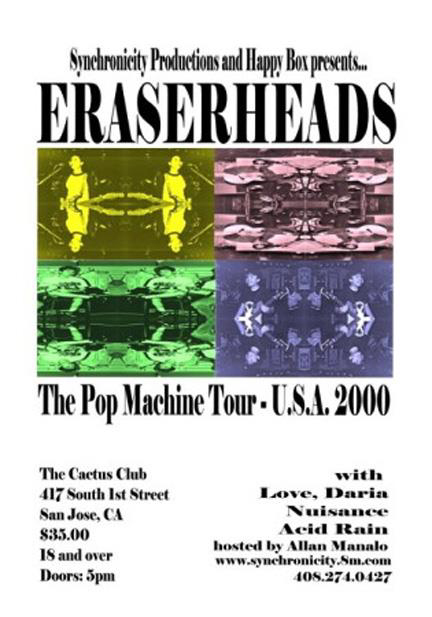 2 Fri - gig at T.U.P. 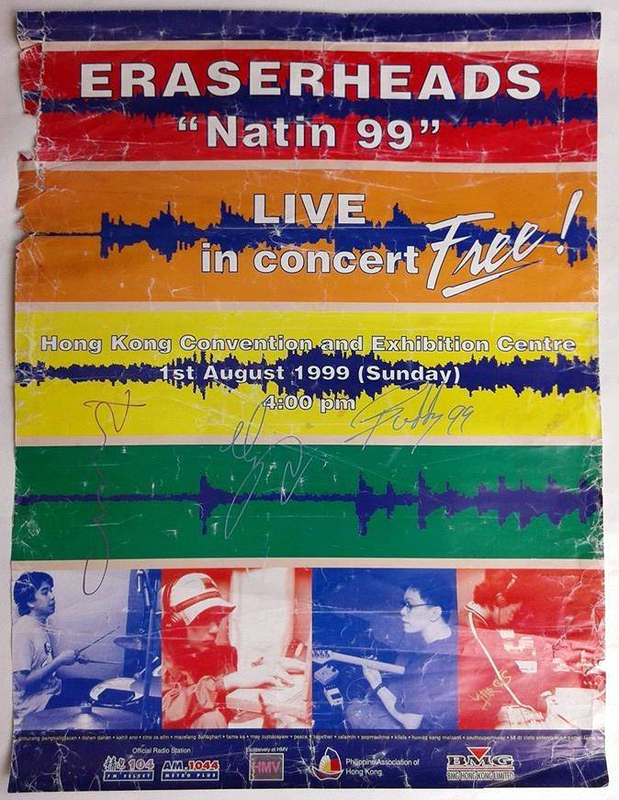 - Despite a number of nominations, the Eheads didn't show up at the "1998 NU Rock Awards" due to hectic recording schedules (?). 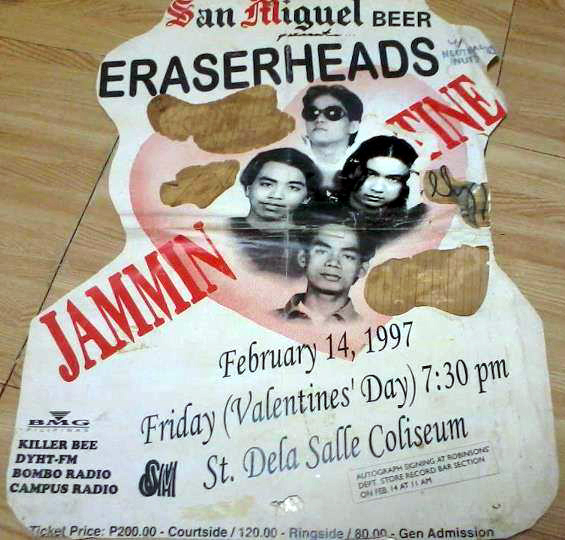 For the first time in the awards history, the Eheads didn't win one award. 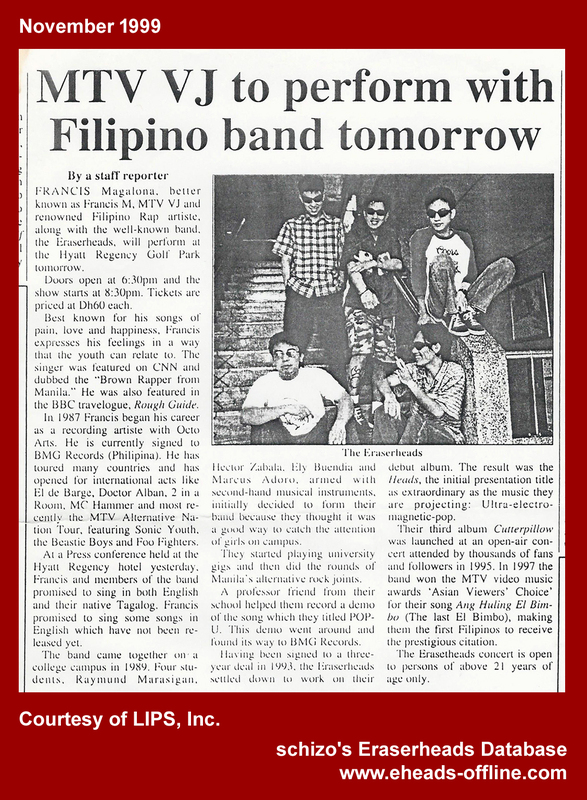 6 Fri - gig at Daungan Restaurant, Timog Ave., Q.C. - Commercial jingle for Oxygen Shirts started airing on the radio airwaves. 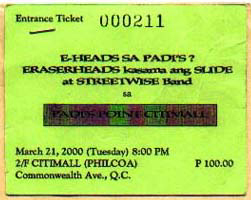 It featured a dance remix of "Ligaya". 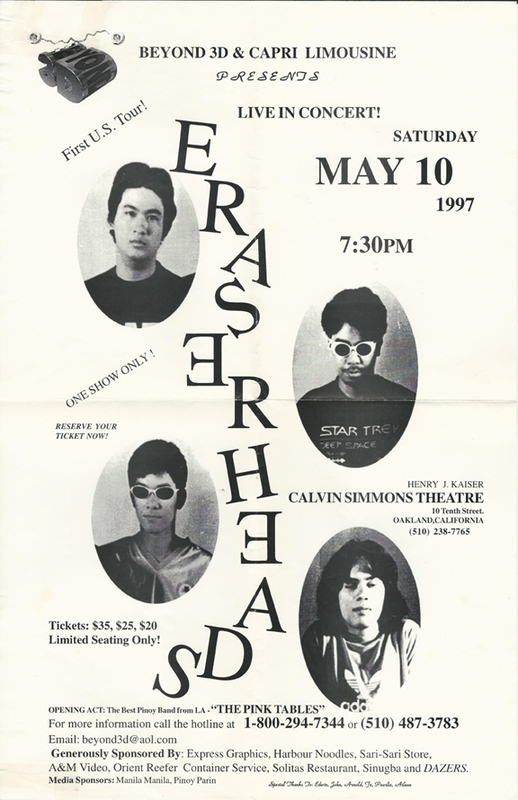 Oxygen released a series of exclusive Eraserheads shirts. 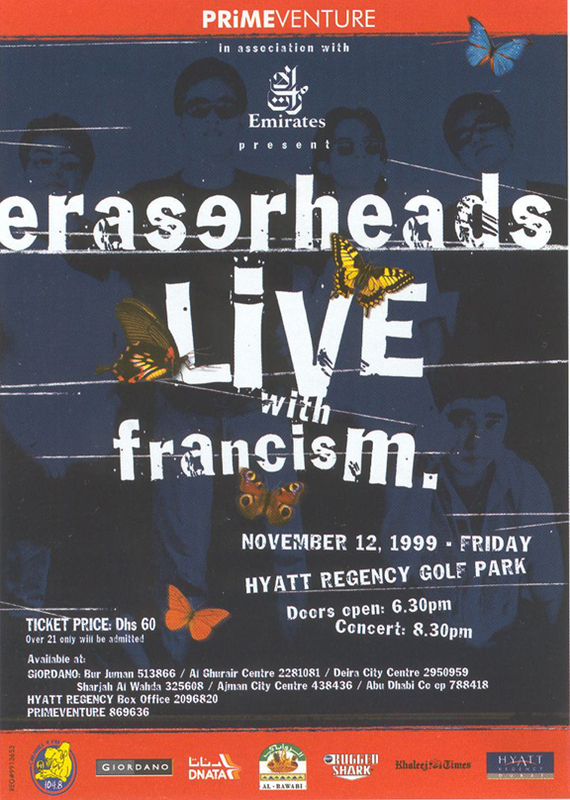 - finished filming the music videos for "With A Smile" (1999 version) & "Spoliarium". 11 Fri - gig at Lite and Live, Q.C. 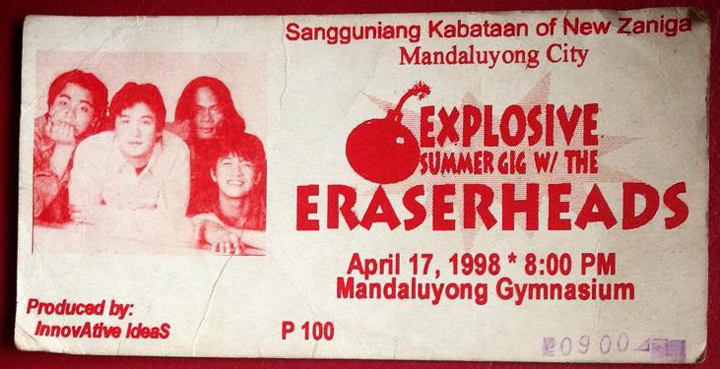 31 Sun - "Electric Fanclub" (the official Eraserheads fans club) registration day, E-Hole, Teachers Village, Q.C. 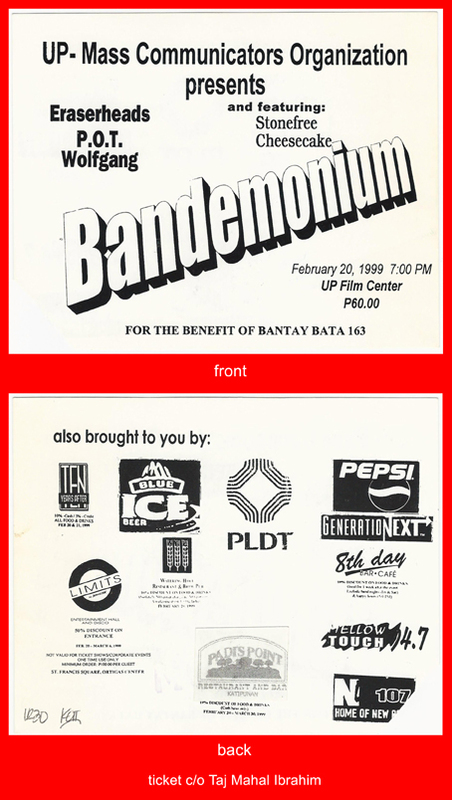 20 Sat - performed at "Bandemonium", UP Film Center, UP Diliman, Q.C. ; 7 PM (with: P.O.T. 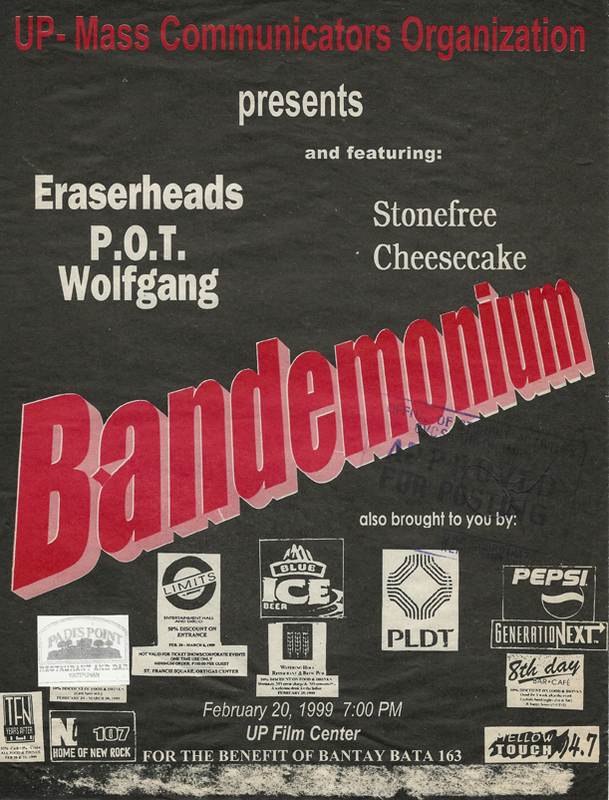 / Wolfgang; also with Stonefree / Cheesecake) (Presented by UP-Mass Communicators Organization) - [view poster & ticket c/o Taj Mahal Ibrahim] / ...gig at Sacred Heart Academy, Novaliches, Q.C. 8 Mon - gig at 70's Bistro, Q.C. 15 Mon - gig at Freedom Bar, Q.C. 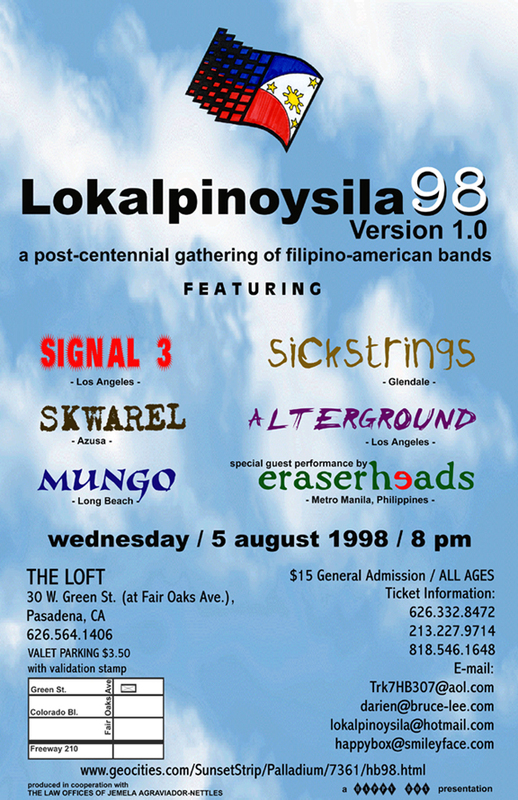 19 Fri - gig at Kampo, West Ave., Q.C. 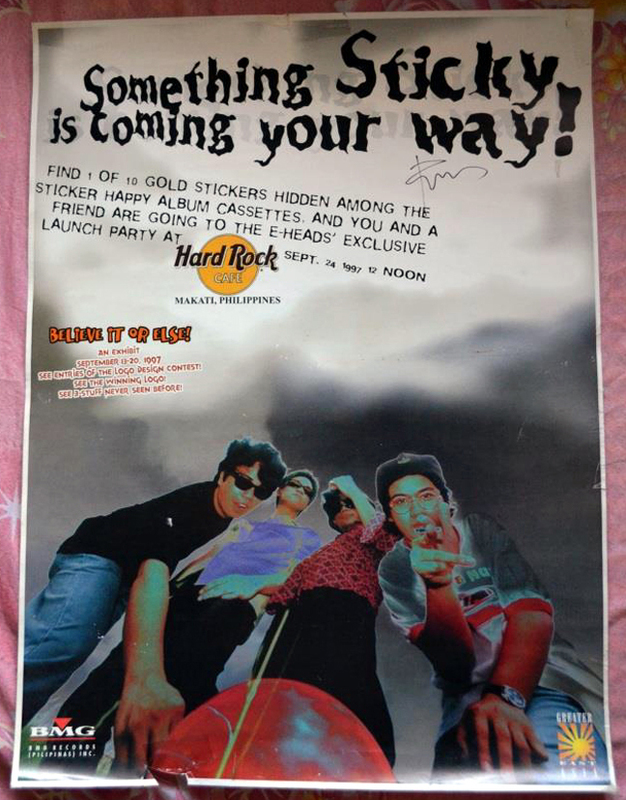 - "NATIN99" Press Conference, Hard Rock Cafe, Makati. 13 Tue - gig at 70's Bistro, Q.C. 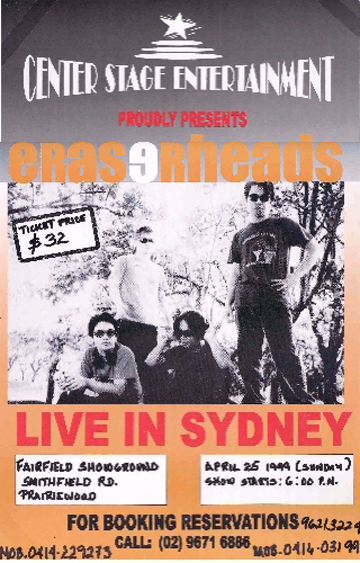 15 Thur - gig at Lite & Live, Examiner St., Q.C. 30 Fri - gig at Farmer's, Cubao, Q.C. 3 Thur - "Brunch" taping (GMA-TV)...gig at Kampo West, Q.C. 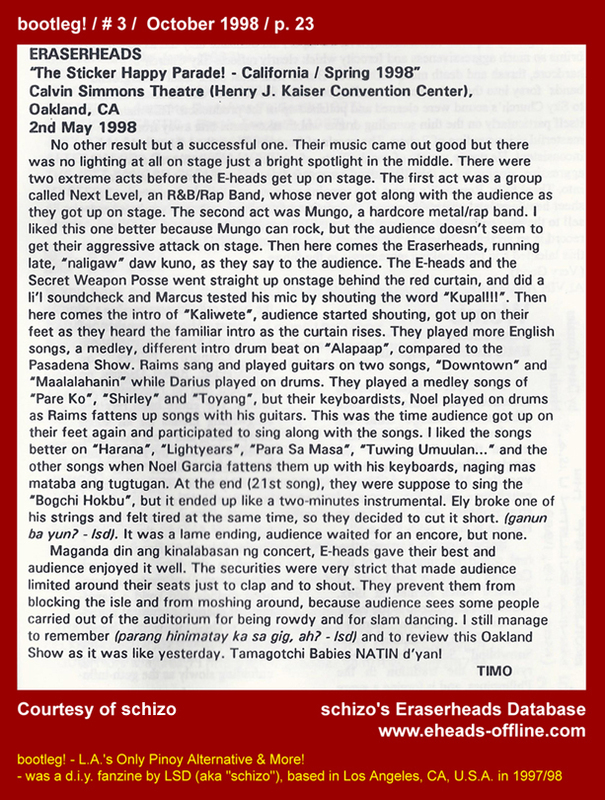 5 Sat - performed on "Eat Bulaga!" 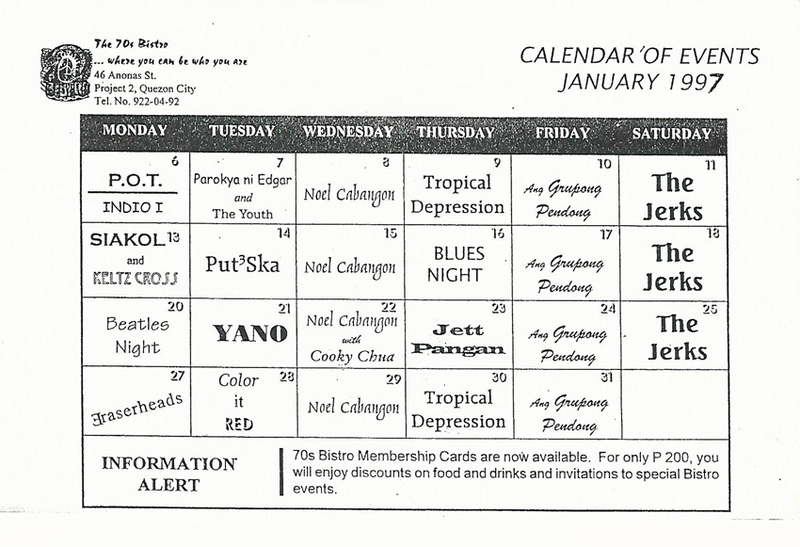 10 Thur - gig at 70's Bistro, Anonas Ave., Q.C. 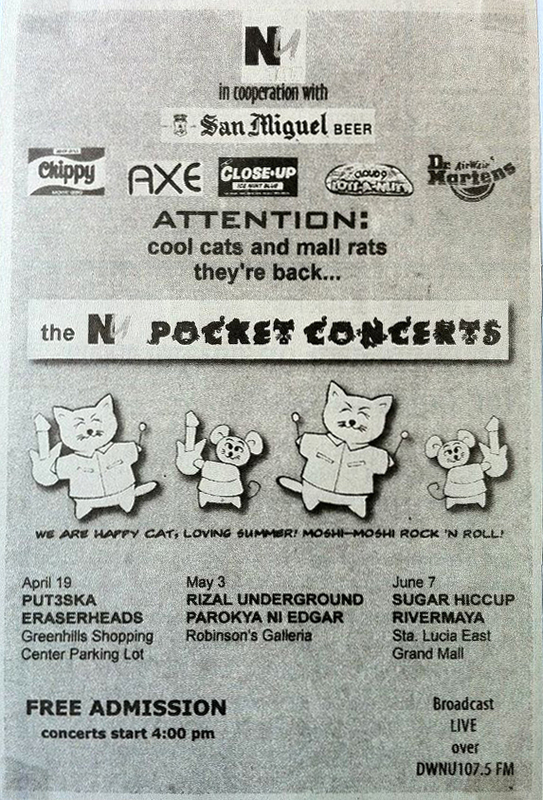 19 Sat - gig at Chatterbox, Robinson's Galleria, Ortigas, Q.C. 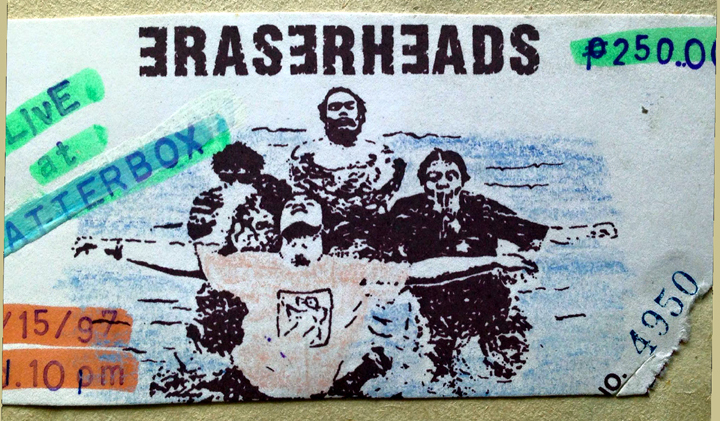 23 Sat - gig at Chatterbox, Galleria, Ortigas, Q.C. 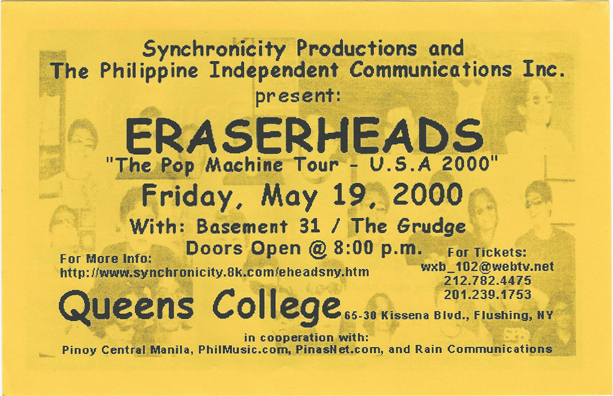 - At the 2000 Awit Awards, they won "Best Performance by a Group/Duo" (Pop Machine). 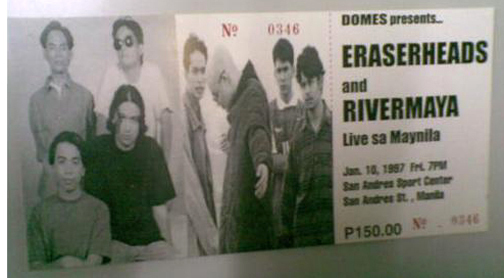 ...gig at Fairs Valley, Novaliches, Q.C. 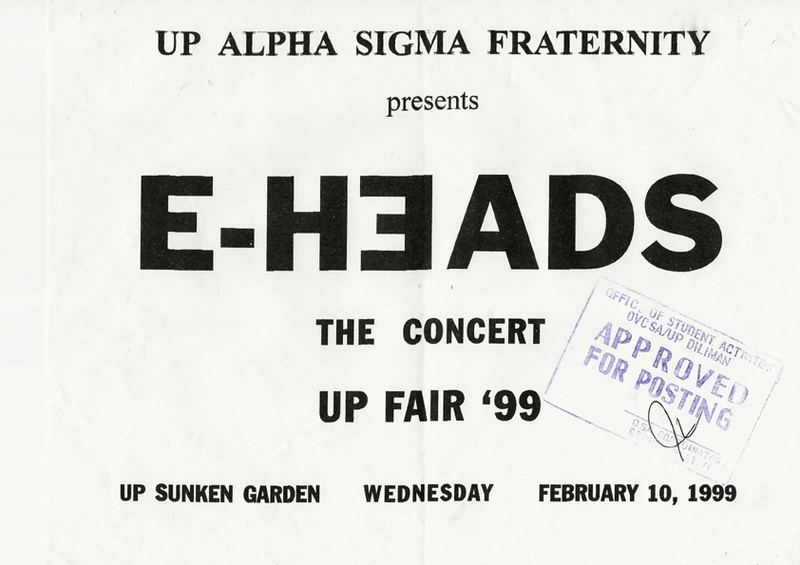 15 Tue - performed at "UP Fair 2000", Sunken Garden, UP Diliman, Q.C. 23 Wed - gig at Budboyz, Tomas Morato Avenue, Q.C. 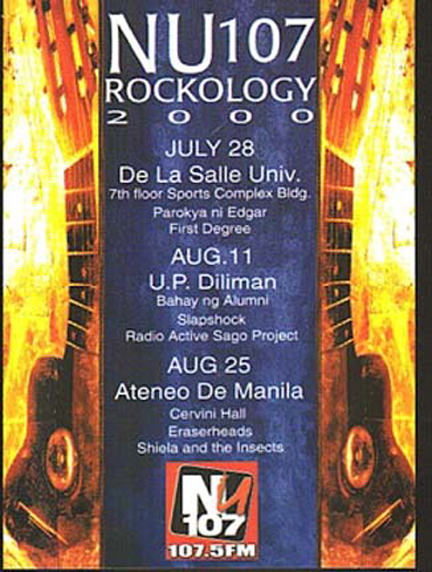 29 Tue - gig at Bahay ng Alumni, U.P. 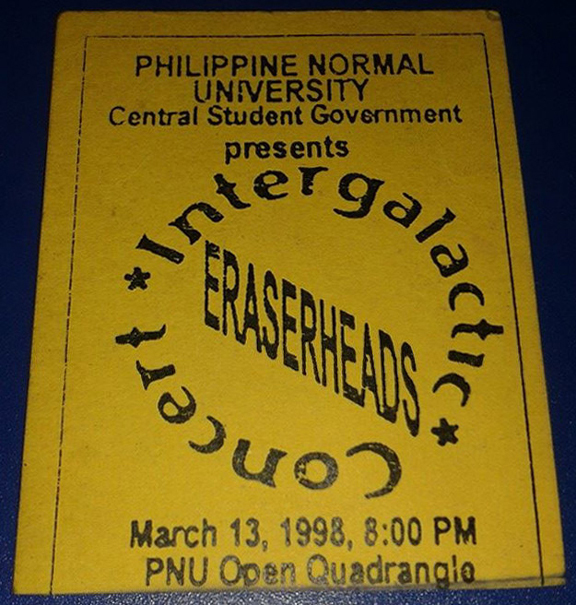 Diliman, Q.C. 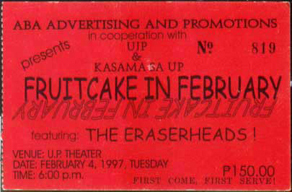 12 Sun - gig for UP-PGH, UP Theater, UP Diliman, Q.C. 17 Fri - performed at "Ozone Concert for a Cause", Ozone Disco, Timog Avenue, Q.C. 10 Mon - gig at Southern Bulls, Timog Ave., Q.C. 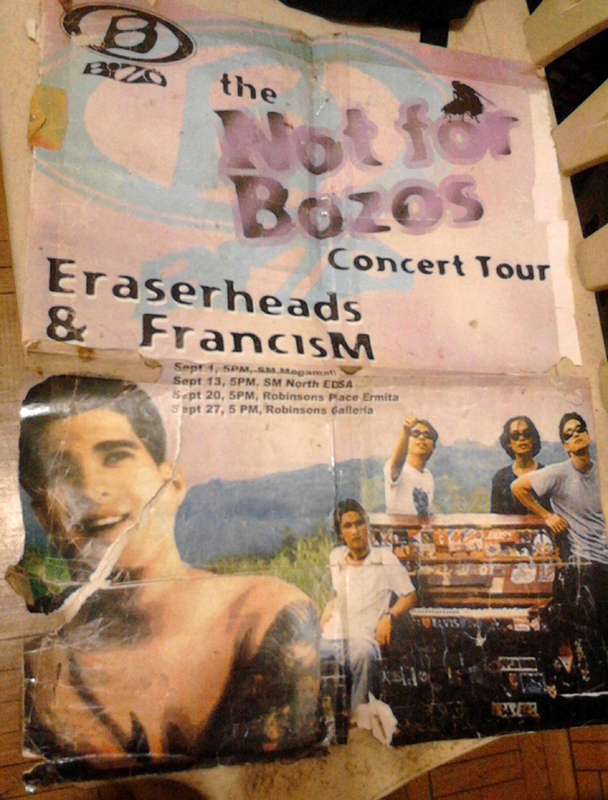 13 Thur - gig at Budboyz, Tomas Morato Ave., Q.C. 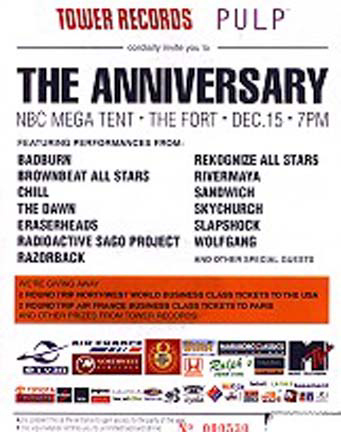 29 Sat - performed at "WRR Music for Life," Atrium, SM Megamall & at "Para sa Masa," Camp Aguinaldo Amphitheater, Q.C. 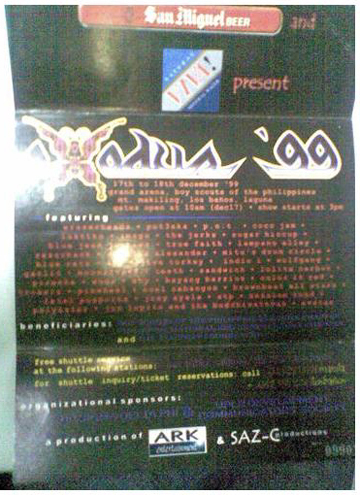 30 Sun - performed at "Araw ng mga Kasambahay", Quezon City Memorial Circle, Q.C. 11 Thur - gig at 70's Bistro, Q.C. 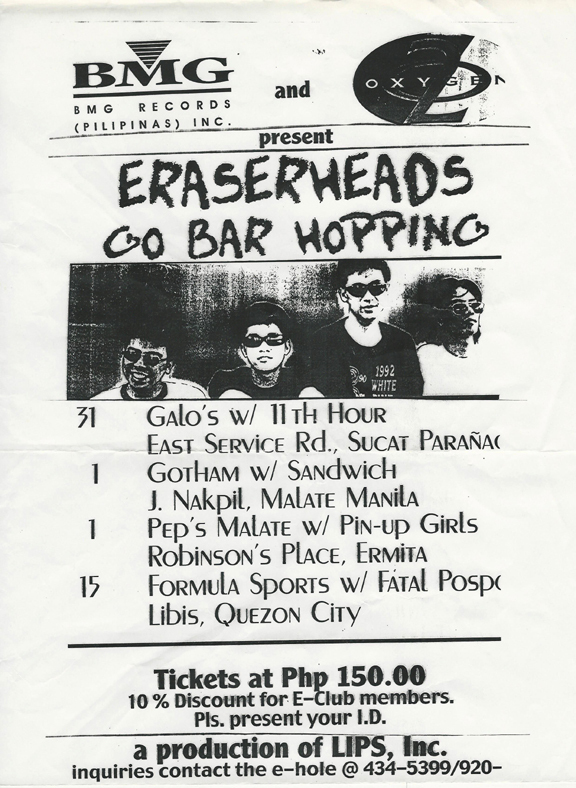 13 Sat - gig at Retro Bar, Roces Ave., Q.C. 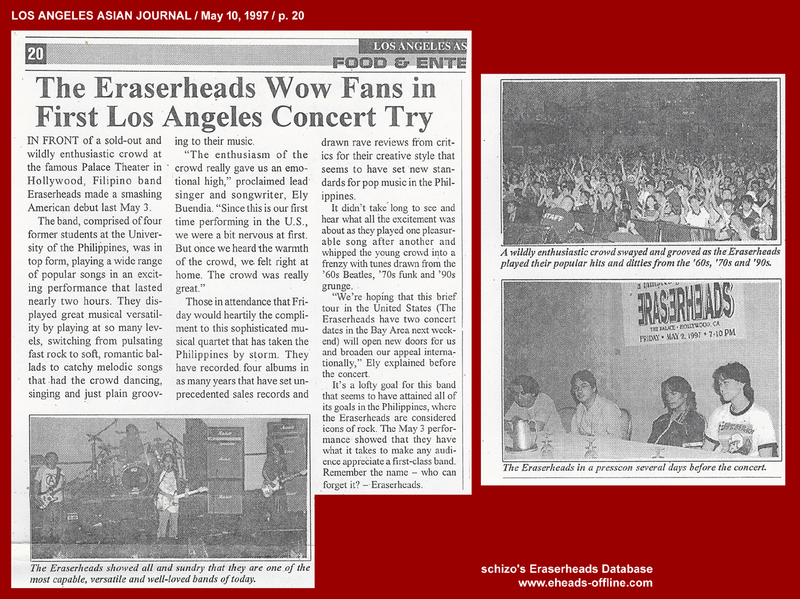 - ...the entourage drove overnight for 6 hours to Los Angeles. 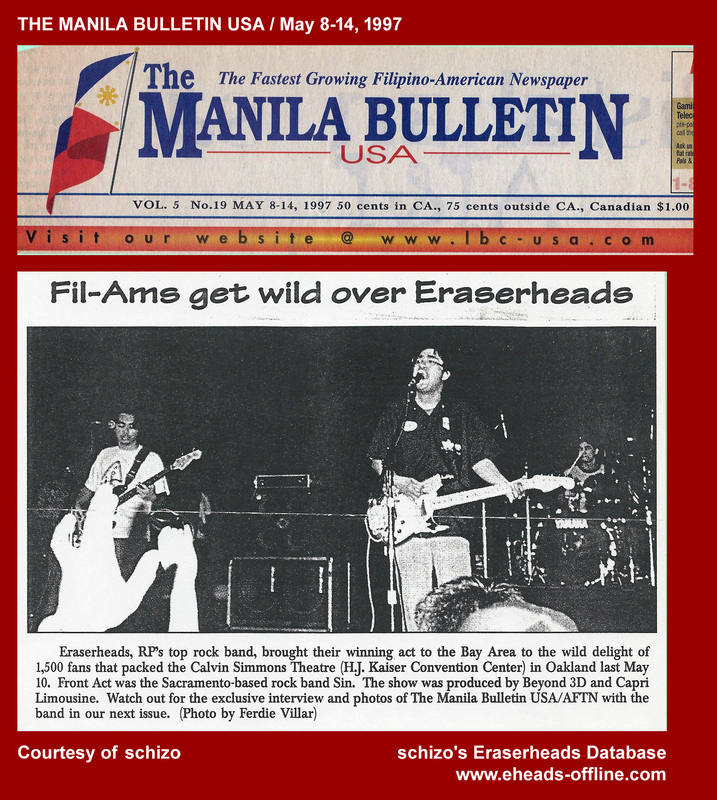 6 Tue - Raimund left for Manila due to "emergency" reasons. 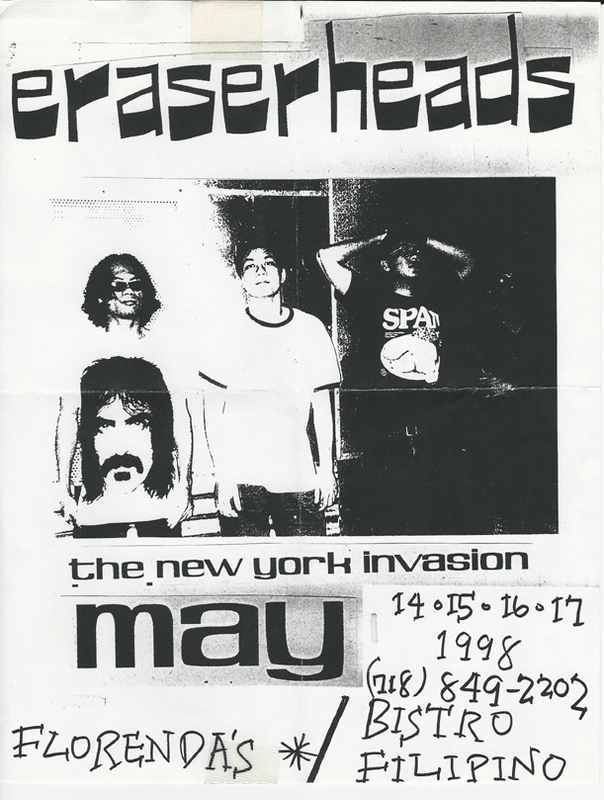 15 Thur - gig at Central Park, Q.C. 19 Mon - gig at 70's Bistro, Q.C. 23 Fri - gig at Kampo, West Ave., Q.C. 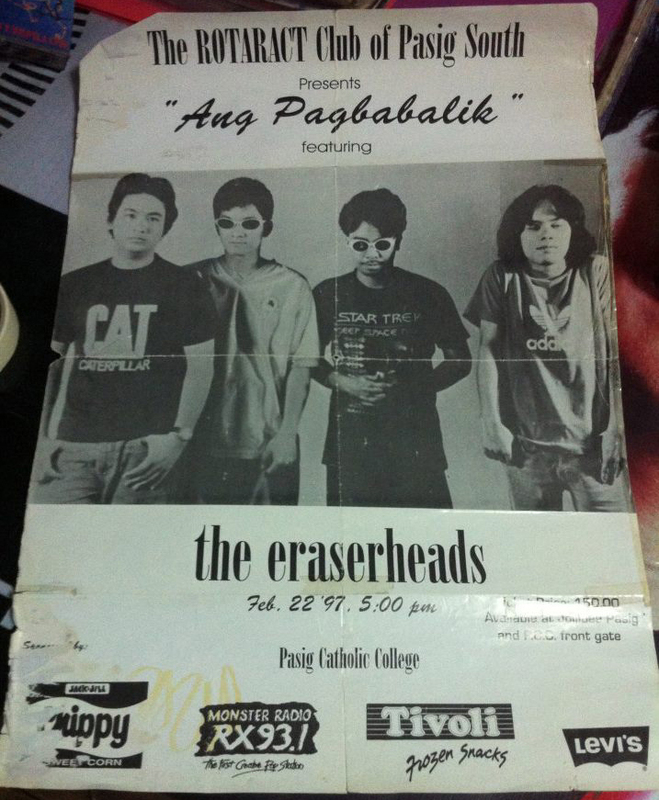 14 Fri - gig at Bahay ng Alumni, UP Diliman, Q.C. 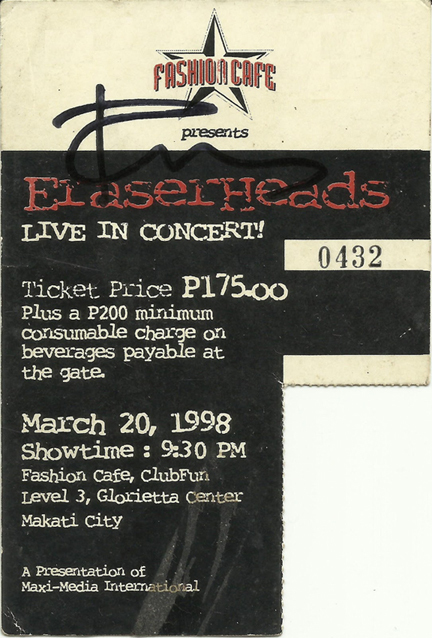 21 Fri - gig at Lite and Live,Tomas Morato, Q.C. 24 Mon - gig at 70's Bistro, Q.C. 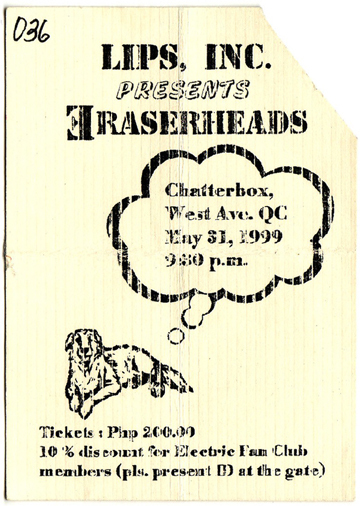 5 Sat - gig at Chatterbox, West Ave., Q.C. 11 Fri - gig at Lite N Live, 32 Examiner St., Q.C. 14 Mon - gig at 70's Bistro, Q.C. 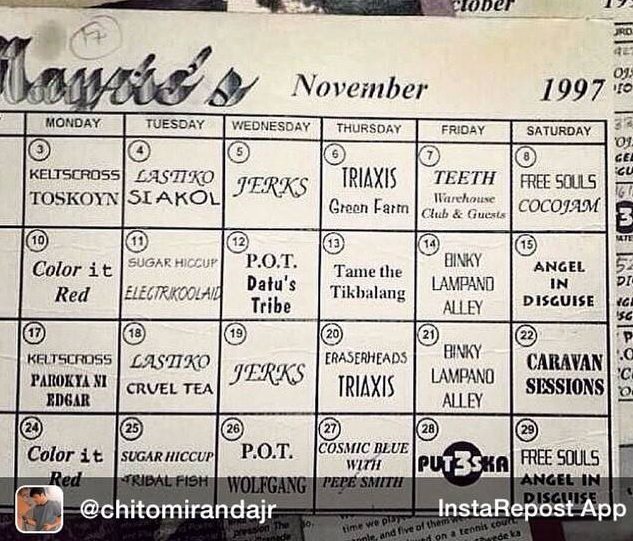 16 Wed - gig at Central Park Cafe, Cubao, Q.C. 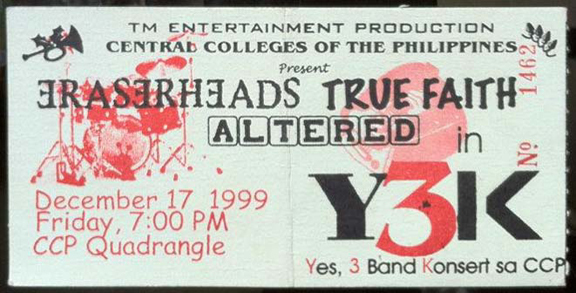 18 Fri - gig at The Padd Bar, 96 West Point, Cubao, Q.C. 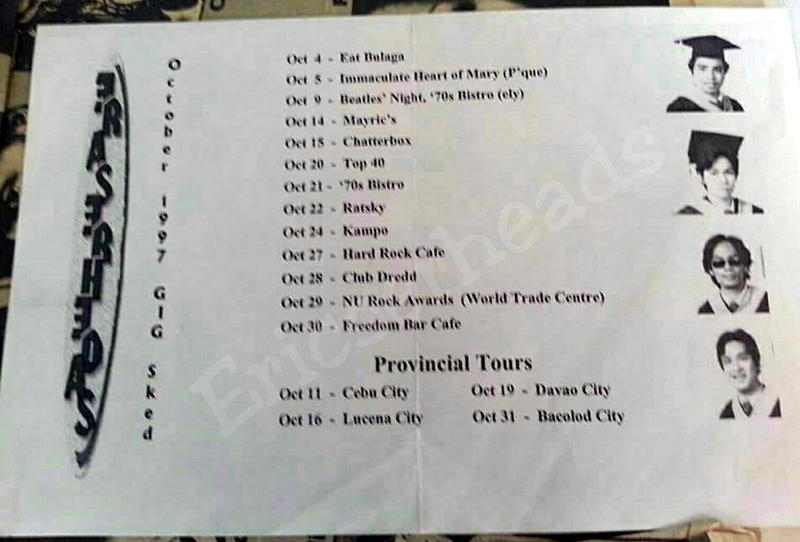 19 Sat - gigs at Phenomena, Timog & Kampo West, Q.C. 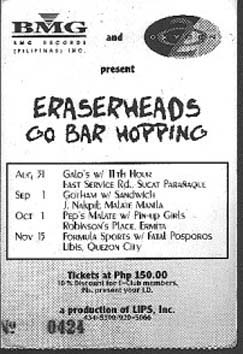 31 Thur - "Eraserheads Go Bar Hopping" at Galo's, Sucat Rd., Paranaque; gig at Chatterbox Galleria, Ortigas, Q.C. 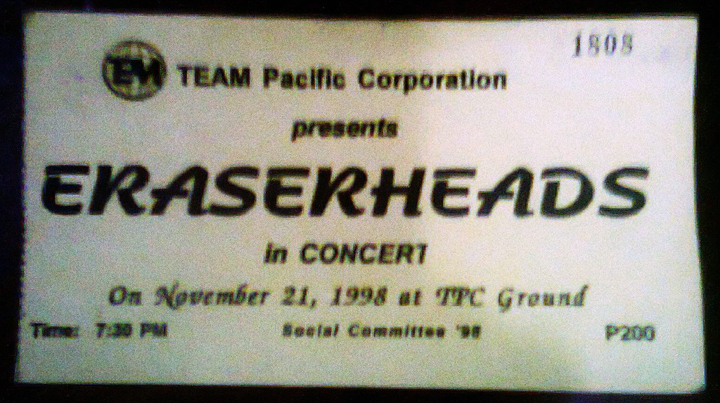 15 Fri - performed at "Oktoberfest", Glorietta, Ayala Center, Makati; gig at Bahay ng Alumni, UP Diliman, Q.C. 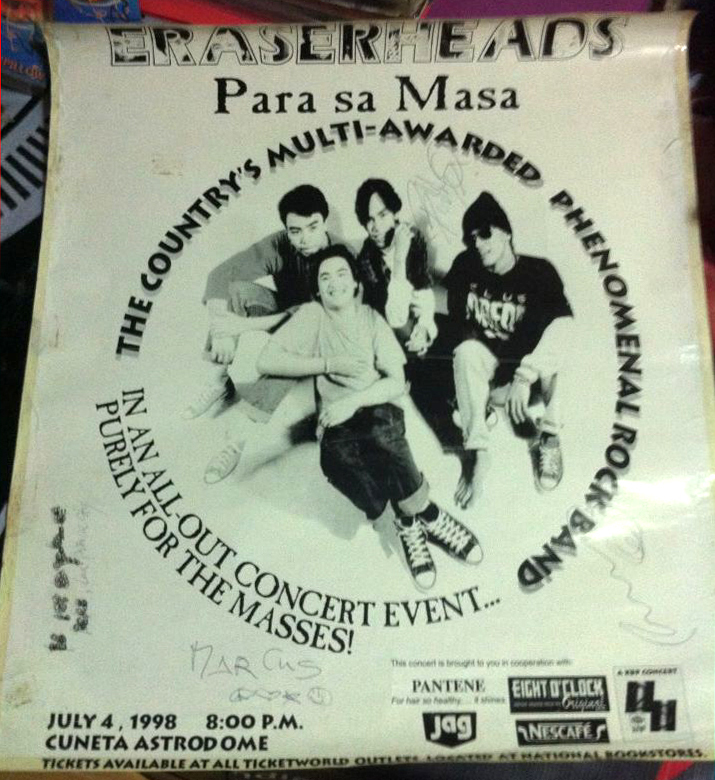 ; "Eraserheads Go Bar Hopping" at Formula Sports, Libis, Q.C. 22 Fri - gig at Kampo, West Ave., Q.C. 25 Mon - gig at 70's Bistro, Q.C. 13 Fri - gig at Kampo, West Ave., Q.C. 23 Mon - gig at 70's Bistro, Q.C. 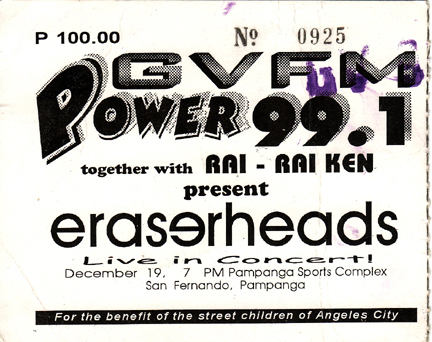 11 Wed - radio performance on "RX93 Concert Series"
10 Tue - gig at Kampo, West Ave., Q.C. 15 Wed - recording sessions for "Carbon Stereoxide" at Tracks Studios; gig at Formula Sports Bar, Libis, Q.C. 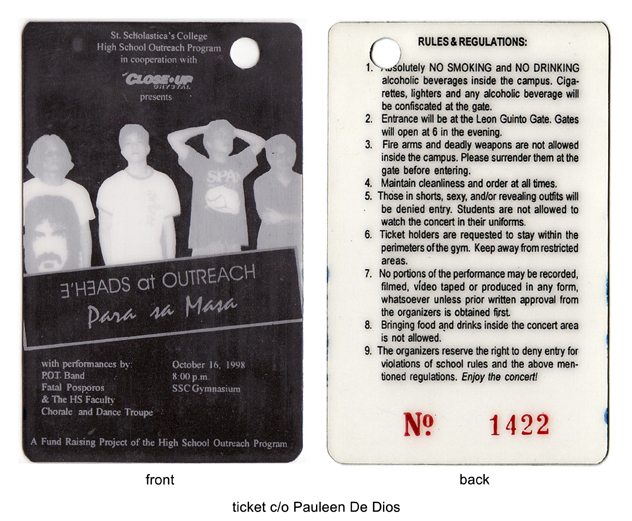 24 Tue - gig at Diliman Preparatory School, Q.C. 25 Wed - gig at E. Rodriguez Jr. High School, La Loma, Q.C. 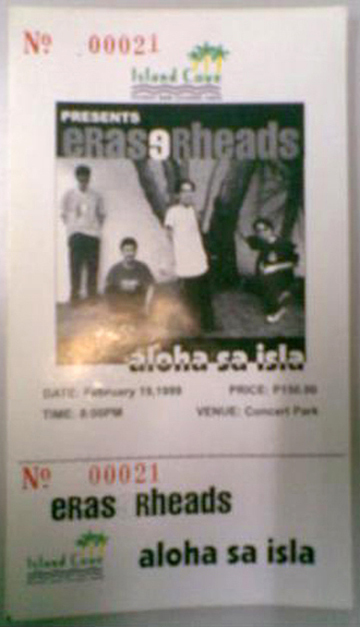 9 Sat - gig at Padi's Point, Philcoa, Q.C. 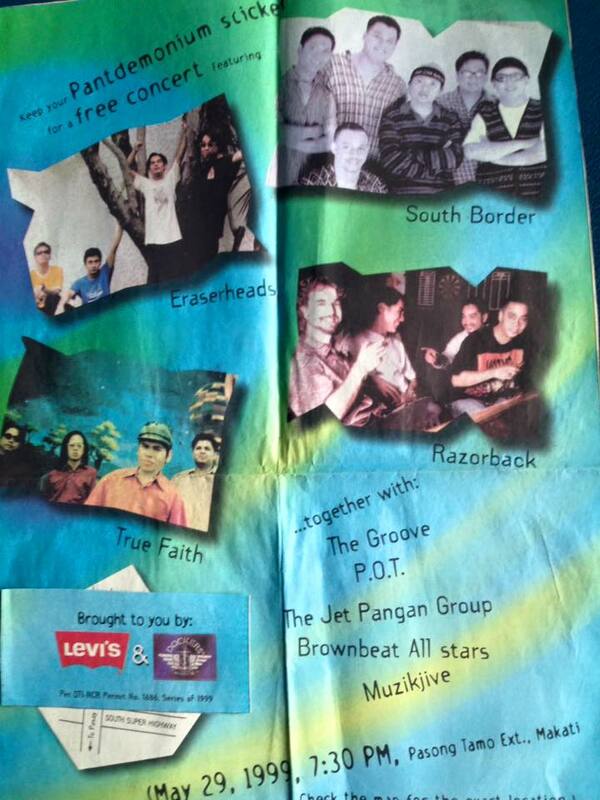 15 Fri - gigs at Ever Gotesco, Recto; UP Diliman & Kampo, West Ave., Q.C. 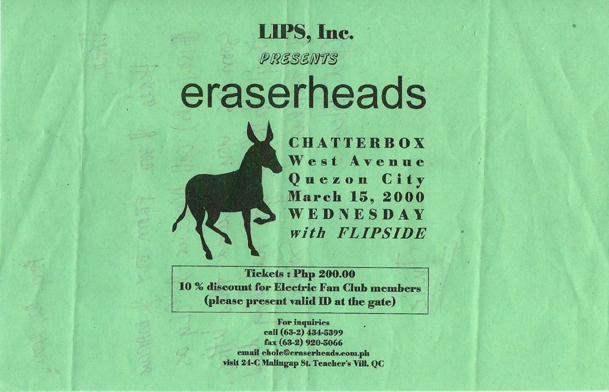 20 Wed - gig at Chatterbox, West Ave., Q.C.